This vintage map chart the journey of the 90th Infantry Division throughout World War II. The map can be zoomed in and purchased at HistoryShots.com. 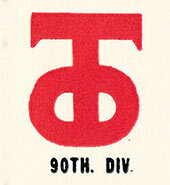 The 90th Infantry Division landed in England, 5 April 1944, and trained from 10 April to 4 June. First elements of the Division saw action on Dday, 6 June, on Utah Beach, Normandy, the remainder entering combat, 10 June, cutting across the Merderet River to take Pont l'Abbe in heavy fighting. After defensive action along the Douve, the Division attacked to clear the Foret de Mont Castre, clearing it by 11 July, in spite of fierce resistance. An attack on the island of Seves failing, 23 July, the 90th bypassed it and took Periers, 27 July. On 12 August, the Division drove across the Sarthe River, north and east of Le Mans, and took part in the closing of the Falaise Gap, taking Chambois, 19 August. It then raced across France, through Verdun, 6 September, to participate in the siege of Metz, 14 September - 19 November, capturing Maizieres les Metz, 30 October, and crossing the Moselle at Koenigsmacker, 9 November. On. 6 December 1944, the Division pushed across the Saar and established a bridgehead north of Saarlautern, 618 December, but with the outbreak of the Von Rundstedt drive, withdrew to the west bank on 19 December, and went on the defensive until 5 January 1945, when it shifted to the scene of the Ardennes struggle. It drove across the Our, near Oberhausen, 29 January, to establish and expand a bridgehead. In February, the Division smashed through Siegfried fortifications to the Prum River. After a short rest, the 90th continued across the Moselle to take Mainz, 22 March, and crossed the Rhine, the Main, and the Werra in rapid succession. Pursuit continued to the Czech border, 18 April 1945, and into the Sudeten hills. The Division was en route to Prague when the war in Europe ended.